Real estate has outranked stocks/mutual funds, gold, savings accounts/CDs, and bonds as the best long-term investment among Americans for the last 5 years. With the Seattle real estate market defying every housing market trend – a huge problem remains: there are more people looking to buy homes than there are homes available for sale. With Seattle’s population rapidly growing recently thanks in part to large homegrown businesses like Amazon and Starbucks. Home values in King County, which is where Amazon is located, have appreciated twice as fast as the national average. Notwithstanding that the current Seattle market has remained a seller’s market for some time now, Seattle homeowners are still hesitant to sell. So, what’s a home buyer to do when the market offers them no relief? There are a few strategies that a potential home buyer can do to not just set them apart from their competition, but help them land the home they dream of. a. If you are able to be flexible with your timeframe, let the seller know that you are willing to move as quickly — or as slowly — as they need. If the seller is looking to close their home within 30 days, they won’t be very interested in an offer from someone who won’t be ready to move for 60.
b. Do anything you can do to speed up the buying process and make it easier for the seller. This includes getting a pre-inspection. c. Get prequalified by a home lender. Pre-qualifying yourself for a loan demonstrates to the seller that you have been vetted financially and details how much mortgage you can afford. If you want to compete with multiple offers on a home, the best weapon you’ll have in your offer will be using an escalation clause. This will help the seller measure how much more you are willing to pay over another competing offer. When a home seller faces multiple offers, receiving a personal letter from a home buyer can help set that offer apart. Yes, many sellers will just go for the highest bid. However, if the home seller has an emotional attachment to the home, pulling at their heartstrings might just help you land the property. Make your offer irresistible by contributing more money up front in the earnest money deposit. Earnest money is cash provided by the buyer, ranging from 1% to 5 % of the purchase price, that gets held in escrow until the sale finalizes. Earnest money usually acts as insurance for the home seller in case the buyer backs out of the deal. Were you able to purchase a home in a seller’s market? Share your experiences in the comments below! If you are considering purchasing a home right now, you’re probably receiving a lot of advice and information. Although your friends and family will have your best interest at heart, they may not be completely aware of your needs and what is currently occurring in the real estate market. This should be the most crucial question to answer. If you put aside the financial investment, besides money, why did you start to consider purchasing a home? For most, the reason has little to do with finances. Research by the Joint Center for Housing Studies at Harvard University revealed that the top four reasons Americans buy a home have more to do with family and less to do with money. What does owning a home mean to you? What non-financial advantages will you and your family gain from owning a home? If you are starting or already have a family, the answer to that question should be the most significant reason why you decide to go ahead with the purchase of a home or wait until you’re ready. According to Zillow, The median home value in Seattle is $609,100. Seattle home values have gone up 11.3% over the past year, and Zillow predicts they will rise 4.7% within the next year. The median list price per square foot in Seattle is $418, which is higher than the Seattle Metro average of $205. If we look at the estimates year over year, a home that would cost you $600,000 today, might cost you an additional $20,000 if you wait until next year. Simply enough, with home prices increasing each month, it might cost you more to purchase your home the longer you wait to buy one. Your down payment will also need to be higher to account for the higher price of the home you wish to purchase. Buyers should be concerned about more than just home prices. The “long-term cost” of a home can be significantly impacted by even a small increase in mortgage rates. The Mortgage Bankers Association (MBA), the National Association of Realtors, and Fannie Mae have all projected that mortgage interest rates will increase over the next twelve months. This rise in mortgage rates will affect how much financial investment you put in your home. The purchase of a home shouldn’t just be a financial decision; you have to be ready for the changes that it could potentially bring to your family life. 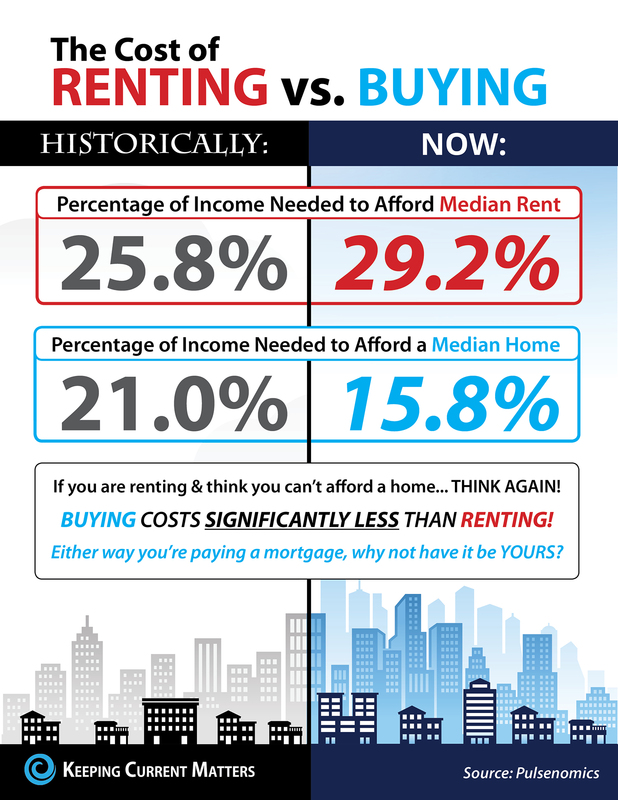 Looking at the percentage of income needed to rent a median-priced home today (30%), vs. the percentage required to buy a median-priced home (15%), the choice becomes obvious. Renters now account for 37 percent of all households, the highest level since the mid-1960s, according to the Joint Center for Housing Studies of Harvard University. The arguments for ownership are compelling, especially for individuals who expect to stay in place for at least five to seven years but probably more. A mortgage acts like a forced savings plan, even if you’re paying the bank hundreds of thousands of dollars in interest for the privilege of building equity. The purchase of a home can be an excellent investment if done correctly and with a solid financial plan. If you currently don’t have an emergency fund, make it a goal to build one. For an emergency fund to be beneficial, it must be useful. Tap into your 401(k) for home repairs or renovations, and you’ll face substantial early-withdrawal penalties. Store your emergency fund in a savings account, that allows you to access your money simply and for free. This account should be separate and different from one where you’d save for short-term goals, such as a vacation or a similar type of expense. Start small but keep saving. An emergency fund that’s too tiny won’t be able to cover life’s unexpected moments. Dealing with a challenge such as a sewer pipe problem, for example, could potentially set you back financially or worse, create debt. Establishing an emergency fund that’s too large has its own drawbacks as well. With more buffer than necessary, those extra funds will earn little in interest in a savings account when they could be building assets faster in investments or paying off high-interest debt. To find the perfect savings spot, aim to start with $1000. This amount could be enough to keep you from having to take cold showers if your heater breaks and provides a financial cushion if any other household problem were to arise. Once you have these funds established, continue to add money to your safety net, so that you’re prepared if bigger crises were to happen, like losing your job or a reduction in household income. Start by building up a fund that would potentially cover living expenses for three months, then work up your way up to six months.Figure out exactly how much to save by determining your monthly payments for electricity, heat, water, food, rent, health care, home mortgage and other necessities. Multiply the sum of those costs per month by the number of months you’re aiming to cover. This method isn’t a perfect science, given that everyone’s situation is different. Depending on your home life and circumstances, you may want to save for a larger reserve. Once you’ve established an emergency fund that covers up to six months of essential living expenses, focus your savings towards retirement and debt repayment. Buying a home can be an incredible investment if your finances are in order. Start saving today; your future self will thank you. Serious About Buying A Home? Get Pre-Qualified! Throughout most of the Puget Sound real estate market, the number of buyers searching for their dream homes widely outnumbers some homes up for sale. In a “Sellers” market, it is crucial to have a solid strategy not just when it comes to getting an offer on a home but when searching for one as well. During your house search, one way to prove to a home seller that you are serious about buying their home is to get pre-qualified or pre-approved for a mortgage before you begin your search. Getting pre-qualified for a home mortgage not only will allow you to know what your home budget will most likely look like but it’s also great negotiation tool as it sets you in front of other home buyers who have not yet been approved for a mortgage by a lender. It’s recommended that you work with your lender to get pre-qualified before you begin house hunting. Pre-qualification will inform you on your mortgage budget empowering you to view homes you actually can afford and enabling you to move faster, and with greater confidence, in competitive markets. Once you have decided on a lender, you will need to fill out their loan application and present them with important information about your credit, debt, work history, down payment and residential history. Potential home buyers today tend to overestimate the down payment and credit scores needed to qualify for a mortgage. If you are serious about purchasing a home and ready for the financial and emotional commitment, begin your home search with a winning strategy. Preparing to buy a home can be daunting. Credit scores, down payments, and mortgages are all on your mind. Here are a few best practices to help you get ready to make one of the biggest investments of your life. Know what your credit score is? If you don’t visit annualcreditreport.com and request your free credit records from all three credit reporting bureaus: The TransUnion, Equifax, and Experian. For a small fee, you can also get your credit score. First up, check the reports thoroughly for any errors that need correcting and/or any negative records they may contain. These reports should also indicate what you can do to improve your credit. Remember, the higher your credit score is, the easier it is to qualify for the lowest interest rates available, which in turn make your purchase more affordable. It is a good practice not to finance anything that may potentially hurt or damage your credit before you buy a home. Become financially ready to purchase a home by planning ahead. Save up for your home down payment of at least 20% of what your expected home budget will be and establish an emergency fund for any unexpected expenses. Not only will you need cash reserves to buy a home, but you’ll also need to prove to a lender that you can afford housing payments that may be higher than what you’re currently paying in rent. If you’re low on cash, as most first-time buyers are, consider taking drastic steps to cut spending. Or try out some ways to increase your income, such as selling some of your stuff or taking a part-time job. Narrow down what home features matter to you most such as home style, size, and preferred location. Use your wishlist to also decide on lifestyle choices like commute times, public transportation, and any other lifestyle options that are important to you. Look for homes that align with these lifestyle choices. Unless you already know where you want to live, take the time to visit a variety of potential neighborhoods. You’ll want to scout out ‘hoods that meet your needs regarding transportation options and other amenities. Exploring different locations will help you narrow your priorities. Visit Down Payment Resources to learn about programs in your area that may help you find down payment money or a low-interest loan. With prequalification, You’ll receive a commitment in writing from a lender for an exact loan amount. Not only will this help you save time and heartbreak by giving you piece of mind to what your home budget will look like, you ae able to use it as a negotiation tool with home sellers as it shows you are just a step away from acquiring a loan. When buying a home, there are best practices you can follow to make the process run smoothly and efficiently. Own the home meant for you. Many people wonder whether they should hire a real estate professional to assist them in buying their dream home or if they should first try to do it on their own. In today’s market: you need an experienced professional! They are well versed and experienced in the real estate market, home purchase process, and the best home sale methods. Real estate is a heavily regulated profession, filled with many contracts, agreements, and duties. A missed deadline could potentially mean losing the home of your dreams. Don’t leave your future up to chance, choose a professional. Negotiating a home purchase or sale can be a stressful and challenging process. Having someone on your side that not only understands the disclosures necessary but the best negotiation approaches can be priceless. Understanding the current real estate market conditions could potentially guide you purchase in the best possible home for you or help you sell your home fast in a struggling market. Setting a competitive price for your home starts with knowing what comparable homes are selling for. Pricing a home too low or too high could essentially hurt your home sale timeline and profits. The same can be said about bidding price for a home, don’t lose what could’ve been the home of your dreams because of your lack of market knowledge.